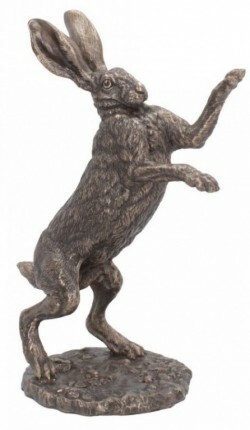 Cold cast bronze hare fighting sculpture with wonderful detail and high quality finish. Solid figurine. Nice weighty feel. Nicely boxed. Jan 2019 release. Andrew Bill from Staffordshire, has been a professional sculptor and artist for over 30 years. He has produced pieces for leading companies such as Coalport China, Royal Doulton and Wedgewood Country Artists. He is the author of the Enchantica novels.